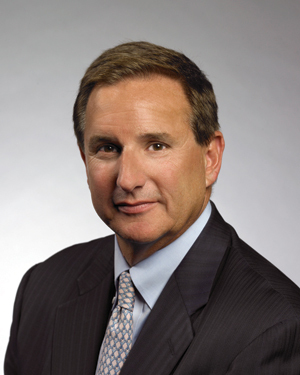 As a senior at Baylor, Mark Hurd was summoned to the office of President Herbert Reynolds. Hurd was president of a fraternity, Phi Delta Theta, that was implicated in homecoming-weekend mischief, and Reynolds wanted accountability. Several minutes into Hurd's detailed explanation of the weekend's events, Reynolds interrupted the young man and asked, "Son, is this a long story?" "I want you to have the facts," said Hurd. "I don't care about the story," said Reynolds, "I just want you to fix it." It was a great lesson in leadership, recalls Hurd. "When you're a leader," he says, "you don't tell long stories. It's up to you to fix what doesn't work." And fix it he did. Hurd brought his fraternity brothers in line and put an end to their mischievous behavior. Such lessons learned at Baylor helped prepare Hurd for a successful career in business that has seen the 1979 graduate lead three companies, including his current role as president of Oracle Corporation. In his more than 30 years of technology industry leadership, Hurd has been repeatedly recognized by Business 2.0 magazine as one of the 50 Who Matter Now and by Barron's in its Best CEOs lists. After growing up in New York and Miami, Hurd came to Baylor on a tennis scholarship. Then as now, the tennis competition schedule was demanding, often taking the student-athletes on the road for a week at a time and causing them to miss classes. "You had to have discipline to be a tennis player and a student," Hurd recalls. "You had to plan ahead, pick the right workload, and get a lot done." "I carried a full academic load, was a scholarship athlete, and was trying to be part of a fraternity - I think all of that taught me the value of time and organization," Hurd told the Baylor Business Review in 2006. "I didn't have a lot of time. I had a lot of things I wanted to get done while I was there, and it caused me to learn to discipline myself. "Frankly, my days at Baylor were not too different from my days as part of a company. I had to manage my time. I had to divide it into certain pieces so that I'd get as much done as I possibly could. And I had to have the discipline to stay focused on the most important things that needed to get done." After Baylor, Hurd was hired as a junior salesman at NCR Corporation in Dallas in what would become a 25-year career with the company. There he held a variety of management, operations, sales and marketing roles, ultimately serving as chief executive officer and president and leading a successful effort to improve operational efficiency, strengthen the product line and drive growth. He also met his wife, Paula, a former senior executive at NCR, whom he married in 1990. Hurd joined Hewlett Packard in 2005, serving as chairman of the board, chief executive officer and president. At HP, his focus on customers, innovation, improved operational efficiency and execution led to significant company growth. As president of Oracle, Hurd oversees one of the world's largest enterprise technology companies, with more than 390,000 customers in 145 countries, roughly 120,000 employees, and annual revenues of $37.1 billion. Hurd's strengths as a strategist and innovator and his focus on customer success have led to growth at Oracle and to expansion in products for telecommunications, financial services, health sciences and other enterprises. Hurd is also an active leader in Oracle's acquisition and integration of new business elements. Hurd continues to show his passion for Baylor by returning to campus as often as possible for home football games and by supporting Baylor's national championship tennis program. With an eye toward bringing future NCAA men's and women's tennis championship finals to Central Texas while also maintaining Baylor's tennis programs among the nation's elite, the Hurds have made generous financial gifts to upgrade and renovate facilities at Baylor's Hurd Tennis Center, most recently in 2011. The Hurd Tennis Center has received enhancements to its 12 outdoor courts, including new scoreboards, shaded and VIP seating and video streaming capabilities, while the locker rooms, coaches' offices and common areas have also been upgraded. The Hurds are faithful supporters of the Baylor Bear Foundation and the Men's Tennis Excellence Fund. Thinking back to his own tennis days under coach John Phelps, Hurd says, "I played and sweated a lot for Baylor and I'm proud of it. I love this school and what it did for me. "We [at Baylor] have worked hard to become really good over the years," he continues. "We had our first Heisman Trophy winner last year, and the women's basketball team won the national championship. When you take part in the progress of Baylor, you build a lot of pride." The Hurds have passed along that pride to their two daughters, Kelly (a Baylor sophomore majoring in pre-business) and Kathryn (age 16). When Kelly was selecting a college, Hurd guided her toward Baylor. "I told her to take advantage of everything she can," he says.